Call it a melting pot, call it a salad bowl, call it macaroni and cheese with some veggies thrown in, England has consistently shown to be a diverse place filled with people from many different ethnic backgrounds. At first, I thought this would just be the case in London. A modern metropolis, the nation’s capital was guaranteed to have quite a bit of diversity, at least in my mind. London certainly did not disappoint. Still, I was unsure as to whether this diversity would continue in the rural countryside. My volunteer experience in Norwich has shown me that it does. Staffed by volunteers from Australia, America, England, India, and South Africa, led by a woman from Sweden, filled with people ranging in age from their teen years to their more wrinkle-filled years, and represented by an equal amount of females and males, the Greehouse Trust operates due to the efforts of volunteers from every different type of background. As it is volunteer work, the company does not offer pay to any of its employees; it does, however, provide an excellent lunch as well as endless cups of tea and coffee to anyone who donates their time and energy there. They ask their volunteers to be timely but understand that speedbumps occur; they ask for efficiency but understand that daydreams can happen; they ask for everyone’s best but expect to use a gracious learning curve with most people. I say this not to build up the company but, rather, because I feel it offers a good parallel to England as a whole. One of the major points of contention in the current election is the issue of immigration. The Liberal Democrats, the Conservatives, and the Labour Party all agree that something must be done to manage more closely the immigration process in the country. Their platforms are quite different but all suggest that the country is worried about the number of people coming into it. The positive side of the election is that none of the parties suggest completely closing the country’s borders; England still very much remains a tolerant nation, willing to allow non-native born people to live in the country. It does ask of those people trying to enter the country to jump through quite a few hoops in order to stay here. Still, once here, those immigrants are offered opportunities to establish a life as long as they abide by certain guidelines. I may not agree with this blog post at the end of the election but, as of now, England operates in a similar fashion to the Greenhouse Trust. The Greenhouse Trust asks that its volunteers prepare to stay with the company for three to four months and follow certain guidelines of behaviour while there. Once accepted, the volunteers are treated equally and with respect. Sometimes there are awkward lulls in conversation during which times people are searching for common ground about which they can chat. But that’s the beauty of it. People are forced out of their comfort zones and must learn about different lifestyles if they desire to work in anything but silence for their four-hour shift. So conversation happens. And the melting pot melds together a bit more. The second co-worker of mine that stands out in my mind does everything he or she can to do exactly the opposite of that. This person is, as Kate Fox would describe, the typical socially dis-eased English person. In no way is this person rude; rather, he or she is simply silent as to not ever ask what could be deemed as an invasive question. While we Americans appreciate boundaries, we will tend to ask where someone is from, what they enjoy doing, and even dare to inquire about one’s name. The socially dis-eased English person will never dive into such murky waters and this co-worker displays this quality exceptionally well. Before continuing this description anymore, let me pause to detail my understanding of what the term ‘socially dis-eased’ even means. It’s not a term I enjoy using. It does seem rather unfair to the people being described as it paints them as almost perpetually uncomfortable and uncomforting. This hasn’t been my experience at all in England! People have always been polite and kind but, beyond just those qualities, I have found many to be chatty and warm-spirited. I was invited to spend the winter holidays with a family who had never met me simply because they are a kind family that after hearing that I would not be with my own family on Christmas demanded (without hesitation I might add) that I spend the time with them. They did more than only offer me a spot to stay for a few days. They included me in all their celebrations, treated me like family in their jokes, gift-giving, and chore responsibilities, and never asked for anything in return. The term social dis-ease seems to rob such people of their kindness. Having stressed just how welcoming I have found the English people to be, I have to concede that I agree with Fox that most do have this social dis-ease that she describes. It’s not a rudeness. It’s a highly peaked fear of coming across as too bold, too pushy, too loud, too out of the norm. There is a time and place to be creative, forceful, boisterous, and quirky. Introductions and, often times, the work place do not fall into the category of those acceptable times and places; therefore, one has a great opportunity when finding oneself in a working environment to observe the very social dis-ease that Fox finds so prevalent in the English culture. I’ll re-enact my introduction to this co-worker to best portray the dis-ease of the situation. Keep in mind that his or her side of the conversation never exceeded anything much above a whisper. I’ll note myself as ‘A’ for Audrey and the co-worker as ‘P’ for person to make things clear. A: Hi. I’m Audrey. I just started volunteering today. P: Oh hello. Nice to meet you. A: It’s nice to meet you too. What can I help with? P: I don’t know. You’ll have to wait for the boss. I don’t think I’m allowed to tell you what to do. A: Oh ok…that makes sense. P: Normally people do the washing up first thing in the morning. That’s not to say that you should because the boss might want you to do something different. That’s just what some people do when they first start here. Not that you can only wash up, I’m sure you can do many things well. Maybe you should just wait for the boss. A: Ok, I’ll do that. Thanks. [Pause]. So, have you been volunteering here long? P: [Without laughing] I’m sure you’ll figure it out. The system is rather simple actually. P: [Again, without laughing] We have a lot of volunteers rotating through here so it’s as simple as it can be. You’ll be fine. A: [Again, awkwardly stops laughing] Right. [Pause] [Pause] [Pause] So, the weather is awfully chilly today. P: It’s not so bad. Just need a jacket and you get through it. The conversation continued painfully slowly as we continued to wait for the boss to come from around the corner. I considered multiple times going up to where the boss was to directly ask her what I could start doing. Scared that that might violate some social norm, I decided to hang back and forge through a conversation with P. In that conversation never did I learn P’s name, his or her occupation, interests, age, involvement with the Greenhouse Trust. We were simply to co-volunteers existing in the same place with a task at hand. No additional information had to be shared between us. My insistence in trying to start up conversation that broached these subjects was as annoying and uncommon to this co-worker as his or her refusal to give any information or make any small talk was to me. It’s this type of aversion to small talk, this tendency to remain unknown and unknowing until a familiarity with the other person has been established, that Kate Fox described and that I’m witnessing first hand in my volunteer experience. I’ve been volunteering at the Greenhouse Trust in Norwich now for about two months. The question that most immediately comes to mind is “Well, why haven’t you been blogging about your experiences there?”. Fair question. Like most of my classmates, I’ve found it a difficult to task. We’ve been in Norwich for a good portion of the year. Our senses that were once so peaked are now dulled to cultural differences as those differences are now normal for us. So for a few weeks, I was racking my brain with things to talk about. The accents? They are all pretty similar to one another. What goes on at the Greenhouse Trust? It’s a great organization that promotes green living by offering the Norwich community an environmentally friendly café in which to eat. Still, I’ve worked in cafes before. There isn’t a major difference in how the Greenhouse Trust operates and the way in which the other cafes carry out business. Sure, the Greenhouse Trust is more aware of their energy use and the items they have on their menu, but vegetables are still chopped the same way, orders are still taken in a similar fashion, and tables don’t vary in how they’re being cleaned. Finding a new angle seemed almost impossible. Then I realized that I was working with the cast that Kate Fox must have been observing for her book Watching the English. The gossip, the quiet one who keeps to himself, the overly polite person, and many more. Kate Fox’s observations inspired a class discussion of whether or not the English people were really as she found them to be in her book (a society filled with nervous, socially dis-eased people). While I still don’t believe that her book by its very nature is fair to all English people, I will say that those that work at the Greenhouse Trust support her findings. I won’t use names or any physical descriptions that can pinpoint any one person in particular. My aim is not to blast anyone; rather, I want to use this café as a case study in observing the English person’s behavior tendencies, not unlike Kate Fox’s style. One of the opening segment’s of Watching the English details how the English are a people who gossip often and in a very specific manner. She states that the women raise their eyebrows and the octave of their voices while huddling together and looking around to make sure that no one hears what they’re chatting about. The image that can best portray what she is trying to describe is that of pigeons sitting next to one another on a park bench very closely, cooing in succession for a few seconds, bobbing their heads up and down as they make said noise. I didn’t like this description at first, nor did I find it to be true in any setting. That was before I started volunteering at the café. One person at the café will always have a piece of gossip to share with the group. This person won’t announce it loudly or to just anyone. The person will wait until he or she is one-on-one with another person and make his or her way over, very quietly, to the other person. His or her neighbor’s gardening methods, the cats that meow until the late hours of the night, the loud neighborhood children, the neighbor that might be gaining a little too much weight or is certainly pregnant, other co-workers that have been sneaking from the dried apricot stash in the back, other co-workers that are sitting down when they shouldn’t be (a debatable subject but one that you can’t really debate. You just smile and nod and continue doing the washing up)- these are all topics that this worker will chat about in this very specific manner: very close to you, head popping up and down in constant look out for someone else who might be in ear shot, a high pitched voice yet a quiet one, and raised eyebrows. Kate Fox understood the way in which the English people gossip. At first, I thought she was exaggerating. After observing this co-worker, I realized that I was actually the one observing the wrong people in the wrong way. Uni students are a separate people than their culture in every country. Of course the English university students do not gossip the same way that an older or even younger generation does. If Kate Fox and history and this co-worker show me anything though, I have a feeling they will. Just give them a few years. Closed. Come 6:00 PM on a Sunday evening and this sign is sure to greet you wherever you go in London. As I’m from small town Ohio, closing around this time on a Sunday is nothing new to me. When my classmates pointed out their frustrations about this pattern, I just shrugged it off. After all, it’s Sunday and everyone is taking the day to go to church and be with family right? Maybe the later half but definitely not the former in regards to life here in London. Everyone will take the day off to be with family and go to the pubs. So, I guess I should revise my opening sentence. Everything other than pubs closes in London at 6:00 PM on a Sunday. What an interesting situation though. A city that boasts St. Paul’s Cathedral and Westminster Abbey as two of its most important attractions, London on the surface seems to be quite proud of its church-respecting and outwardly seeming church-going nature. Upon further reflection, however, the churches in London seem to be used for everything but that. Upon entering Westminster Abbey or St. Paul’s Cathedral, two magnanimous symbols of the city of London, the agnostic tourist or devout Anglican alike are necessarily awe-struck – indeed, that was the effect intended by these buildings’ creators. Perhaps what is more staggering to the visitor than the architecture or sheer size of these spaces is the opulence of the details which adorn them. The ceiling of St. Paul’s cathedral glitters with thousands of gilt mosaic tiles; In Westminster Abbey, the spires, cornices, corbels and tiny arches build into a gilded backdrop to the altar is transformed into a miniature castle by the noonday sun; In both venues, the admirer can surely imagine just how many painstaking hours went into the woodcarving of furniture, panels and memorials. …The primary functions of Westminster Abbey and St. Paul’s Cathedral are no longer to serve as places of worship, but rather, to serve as tourist destinations and symbols of the city of London. It is ironic that the modernized and secularized London should chose religious institutions as their symbols. However, it could be argued that the Londoner no longer looks at these spaces as sacred – indeed, Londoners have bastardized them by building cafes, bookstores and giftshops within the cathedral walls – but rather, as opportunities for profit, an idea which will be more fully developed later. As demonstrated above, churches today seem to be used for the revenue they can bring in- they seem to be machines for monetary gain. That isn’t to say that all churches fit this classification though. Smaller churches that hold much more modest services seem to still operate with their main goal being to act as a place of worship. It’s important to note here that these churches are not only few and far between but also are in need of some of the monetary attention given to the other more commodified ones. The difference in monetary prominence and traditional religious practices between the iconic churches of London and the smaller churches can be easily seen in comparing St. Paul’s and Westminster Abbey with St. George the Martyr Church in the Bloomsbury area. The later like the other two does have a claim to fame in pop culture: Sylvia Plath was married there. Despite this rather important event in its history, the church continues on as a ‘normal’ one in that it holds modest services throughout the week and has open doors for anyone who would like to pray or worship on their own during non-service times. The walls are chipping, the ceiling is in need of repair, a few light bulbs could use replacing- the church isn’t a collection of bedazzling and impressive sights; quite the contrary, its simplicity characterizes it most thoroughly. The staff welcomes you with smiling faces to come in and have a look around but they don’t fuss over you at all. They don’t try to make you feel overly comfortable, they don’t make sure that you only look at the pretty parts of the church, they don’t make sure you have the most delightful visit of all time so that you’ll come back and bring all your friends. They do welcome you, allow you to experience the church on your own, and they leave the decision of whether you want to come back or not as completely yours. What I’m trying to get at but not saying incredibly directly is that they don’t try to butter you up to both take your money and have you spend some at the gift shop too. They don’t even have a gift shop. They have a place of worship to which they would love for you to come back on Sunday at 9 to join in their services. We can’t make a generalization of how this pattern in churches speaks to the religious piety of the city nor is that something we want to even try to do. Mosques, gurdwaras, synagogues, many other places of worship are quite present in London. Our experiences with the churches of the city though have shown us that this type of presence alone doesn’t necessarily correlate to any felt sense of spirituality. We’re not here to analyze whether this is ‘good’ or ‘bad’ or ‘right’ or ‘wrong’. We are here to observe this and begin to process how this helps us examine the rather complicated London identity. Take a drink with me! But can I take a drink with you? Pub life in London. It has potential to be the great equalizer. A place where anyone over a certain age can enjoy a pint (or a glass of wine, or a mixed drink, or more than a pint…) of the drink of their choice and just chat with people inside the establishment. In the less tourist-filled places, pub life has the potential to really be a place where communities can come together. After a day at work, what could be better than grabbing some food and a drink with your neighbors while chatting with your co-workers and a friendly bartender? It sounds like an ideal way to cap off a day. If only everyone really did enjoy it. Yes, the pub is open any and every one. But those who really are a part of the ‘authentic’ pub culture are, to this observer, those who hold on to the old British identity. Upon entering a pub, you’re sure to see a few men in suits in the corner getting drinks before heading home, a few young people on dates and chatting with friends, and a couple regulars in brown leather jackets who are talking with the bartenders about intimate details of their lives. Who isn’t there? The large Bangladeshi, Pakistani, and Indian populations, the tourists (they won’t be in until about 9 or 10 because they don’t quite realize the time that pub life really peaks over here), and the women who stay at home all aren’t present. I don’t think there are any fingers to point here. The pubs are open, anyone can come who wishes to, and the beverages offered all the same for all who walk through the door. Still, it’s a little disheartening that it is such a homogeneous group that composes such a recognizable part of British life. When you think pub, you think England. How frustrating that when you think pub culture, the image that pops up is that of such an un-diversified crowd. That being said, I have thoroughly enjoyed all of my experiences with pubs. The food has always been great (though a bit pricey), the drinks have always been delicious, and I have always gotten some satisfaction out of asking for a pint. It seems like such a grown-up thing to do. And while I have always gone to pubs as a part of a large group of students who are all clearly tourists, I will say that I haven’t really gotten to interact with the ‘authentic’ British people present at the pubs. Yes, we are noisy tourists that are intruding on their pint time but I still am disappointed in the lack of experience I have with chatting with the locals at the pubs. That’s something I definitely want to enjoy in Norwich. I think that I’ll have to find myself in a group of people with natural accents for that to happen rather than a group of people in which the fake accents increase in strength in correlation with how many drinks they have. I’m guilty of the fake accent-ing just as much as anyone else on the trip. But I think that’s definitely a handicap in really getting to experience pub culture (if that’s even possible for a twenty-year old female to do- I’m not convinced that that’s a group that’s really accepted into ‘authentic’ pub culture. I’m interested to find out though). So, cheers for now and we’ll find out more in Norwich. Though a far cry from the traditional set up of a museum as everything is held in a man’s house, the Sir John Soane Museum showcases aspects of the British identity quite well. In fact, the museum’s success in its portrayal of the British identity might be attributed to the fact that it is in Sir John Soane’s house. The placement demands that attention be paid to the man and the object rather than just the objects on display. The objects he collected are incredible- beautiful, intricate, and plentiful. Still, one would find difficulty leaving the house without considering how the objects, the man, and Britain all tie together. Sir John Soane, an architect most famous for his work on the exterior of the Bank of England, understood the importance of inheritance in the British social set up. The son of a mason, he was in good company for improving his skills in the building trade. If he was content with being just another mason or even just another architect though, I wouldn’t have anything to write about in this post; that is, his collection, his museum, his legacy, his influence- none of this would be possible. His social stature needed to improve. Sir John Sloane lived and worked during the Georgian era, a time known as the “Age of Aristocracy” in which the British aristocracy enjoyed a level of prominence in society. While wars of independence and revolutions for social equality raged in other lands, the English social scene continued to favor the upper classes that the others were rebelling against. 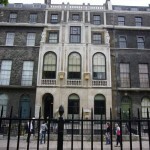 Understanding the importance that his social stature had in such a society, Sir John Soane married into money in 1784. This marriage gave him the social status that enabled him to reach a more elite class of customers and, as a result, be involved with more impressive and monumental projects. His talent alone was noteworthy. Before he married, he had already won many awards in architecture, traveled to Italy to perfect his craft, and had began compiling images for a publication that would come out in 1788. I don’t mean to belittle his talent at all. Still, it wasn’t until after his marriage that he started to design more major projects including his most famous work on the Bank of England. There has to be a link between the wealth and stature he acquired in his marriage and the timing of his more famous works. Yes, he was good but you have to be great to be sought after to work on such large-scale projects as the Bank of England. Why was he sought after for such projects? I would argue that the answer lies in the fact that people of a certain social circle knew his name because of his social status in London. Soane’s displaying his possessions to the public can be seen then as a key portrayal of the British identity. He was able to collect all of these remarkable objects because he was wealthy and influential enough to even be considered as a possible owner in the first place. His social climbing, in my opinion, played a major part in getting him to that status. Let’s remember that Sir John Soane didn’t just display these impressive objects in a building (something he could have easily crafted given his profession). He displayed everything in his house and, in doing so, put his house and himself on display as well. His life became part of the exhibit. So truly his life must be considered as much as any of the objects in the museum upon reflection. The statues were beautiful but does anyone need that many? Short answer: no. Sir John Soane seemed to think differently though. For this reason, his seems to have an understanding of the importance of showing off one’s social status in the English society. He needed people to understand just how well off he was. What better way to accomplish such a thing than to display impressive object after impressive object in the context of your home ? Interestingly enough, the museum has been and continues to be free of charge to the public as was declared by Sir John Soane the way it should be. This fare gives every person the same opportunity to visit the museum as the next. Was this a way in which to thwart the social fixtures that seemed to consume his society? Or was it a way to show off on the most massive scale possible? I’m not sure. But this college student certainly appreciated the fee. But no matter what the cost was to get into the museum, I think its impossible to only call it that. It’s more than a museum. It’s a portrayal of a man’s life and the society he tried so hard to impress. I had a huge problem with the Victoria and Albert Museum. Maybe that’s not the most gracious of ways to begin a post but it’s the only way that seems fitting. I was really excited to go to the museum. Not only had I heard only rave reviews from my classmates but I had also been introduced to just a taste of all the many ways that Victoria and Albert aided the arts and science communities on our very first day here on our tube stop adventure. I was expecting a museum that displayed some of the finest collections of art-sy and science-sy things shown off in an almost magical way. What did the museum show me though? Wedding dresses. The only thing I remember from all of the exhibitions is the fashion room. Maybe that wasn’t the best room for a person like me to go into (I’m not the best at coordinating colors and prints but, in my defense, I at least know that plaid and stripes don’t go together). Still, I think that a person without the least bit of fashion sense should be able to go into an exhibit in this type of museum and not come out with a feeling of outrage. Now, I have been researching feminist literary figures in the Bloomsbury area for the past week so maybe I’m a bit more sensitive to gender issues than I might normally be. That being said, the fashion room was laid out in a way that seemed to make the statement that the epitome of female dress could be found in a wedding dress. I don’t know if I’m alone in this sentiment but that statement couldn’t be more belittling or insulting. In my mind, glorifying a wedding dress in this way fits into the mindset that women are to only aspire to be a wife. I have nothing against marriage and think that being a stay-at-home-mom is quite a respectable position in life. But to be limited to such a role is wrong and it is exactly that limitation that I feel the fashion room in this museum was advertising. Women have for years been actively pursuing equal opportunities in the workplace and home alike. Many women from the London area made great strides in assuring these opportunities came about. In the literary world, Virginia Woolf, George Eliot, Vera Brittain, Jane Austen– these are just a few of the women who pushed their way to the forefront of the literary world and showed that women had as much talent as men and should be given the opportunity to showcase that talent. Other influential women such as Millicent Garrett Fawcett, Sylvia Pankhurst, and Nancy Astor also have an important influence in the city. Let’s not forget that some of the most memorable sovereigns of the nation were women. Queen Elizabeth I, Queen Elizabeth II, and even Queen Victoria herself made contributions to the well being of the nation that cannot be overlooked. Though incredibly diverse in their many accomplishments, all of these women have one thing in common: their lives amounted to more than a wedding dress. The Victoria and Albert Museum seems to ignore the rich history of powerful females in London though and, instead, caters to the idea that the aspiration of women is to look good on their wedding day. I think this is most clearly demonstrated in the wedding dress by Neymar that was worn by Angela Stamp on their wedding day in 1976. It was designed to resemble something Anne Boleyn would have worn. Anne Boleyn used marriage as a social stepladder more than possibly any other woman in history in my opinion. Taking any connection to the dress’s primary influence away though, the dress itself showcases exactly what the feminist movement was rebelling against in the 1970s. It is embroidered with beads and flowers and covered in frills and folds is such a way that it emphasizes the dress not the woman. In fact, the mannequin on display has absolutely no facial attributes at all. The woman is literally unnecessary. To me this implies that any woman can be placed into this dress, it wouldn’t matter at all who is in it. The dress is going to serve its purpose. The dress is going to find the desired husband (the husband who wants his wife in such a dress and will pay to make sure she looks like this to her public). Yes, it is crafted beautifully and is truly a sight to see. Other dresses were just as beautiful though, but it was this dress along with two other wedding dresses that were on display in single cases. It was this dress along with two other wedding dresses that attracted everyone’s attention. 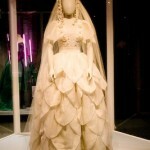 The museum is compiling a collection of wedding dresses for their wedding dress exhibit in 2013. It’s currently 2009. These wedding dresses aren’t a part of that exhibit. These wedding dresses are a part of the everyday collection and as such send the message (at least to me) that these are important enough to be set aside from all the other dresses because they are the most important clothes that women can ever put on. I would argue that’s just simply not the case. I’m not even going to get started on the significant lack of male clothes present in the exhibit. There was a case of suits in the entire room. That was it. I recognize that that inequality is also a problem but the message of limitation through the wedding dresses was what struck me most in the room. Again, I was excited about seeing the museum. Victoria and Albert made incredible contributions to the art and science communities that shouldn’t be ignored. Unfortunately, the way in which the wedding dresses were displayed made all of their accomplishments completely invisible to me. All I could see was lace and embroidery. For the past few weeks we have been bombarded by tours, museums, tube maps, and sightseeing. We have been living the life of the London tourist. However, just last night, for the first time during our trip here, Anthony, Flow, Jeyla, Audrey, Rebecca, and I got a chance to play tour guides to fellow Dickinson students Gina, Luis, and Leslie on layover on their way to study in Malaga. Having been on many Karl-Qualls-Tours, the six of us were fully capable of navigating the city and hitting all the major tourist attractions in the four hours our friends had before they needed to get back to the airport. We took them to the South Bank, Big Ben, Parliament, the Roman Wall/Tower of London, the London Bridge, Tower Bridge, the Millennium Bridge, and St. Paul’s. On Sunday night three members of my posse Leslie, Gina and Luis flew into Europe. For the academic year they will be studying abroad in Spain however their layover for a night was in London. A couple of students decided that it would be great idea to take them out and see our new home, London. Granted they would only be here for a night so we decided to cram in our best London Tour in the span of literally 5 hours. Jeyla and I wasted no time, and rushed on the tube towards Heathrow airport. Our tube cards only go up to zone 3 on the tube, and whenever Jeyla and I passed the boundaries of a new zone we felt petrified that we were venturing out too far. However we got to the airport safely, picked them up, and quickly returned to the hotel. As soon as we arrived they visited some other Dickinson friends of theirs, ate, and we headed out on the town. Last Sunday we got a visit from three of our Dickinson friends, who on their way to study abroad in Malaga, stopped by to get a taste of London! Luckily, we had the day off on Monday, so Audrey, Megan, Jeyla, Rebecca, Anthony and myself decided to show Gina, Leslie and Luis everything that we have seen in the past two weeks. Interesting enough, we all had the opportunity to see something we had never before witnessed. For instance, Tower Bridge was raised, gracefully, to allow a ship to continue to make its way down the Thames. It all happened in a matter of about fifteen, maybe twenty minutes, but it was my first time seen a bridge being raised, and it was Tower Bridge for that matter! It was a magic moment. We walked along the Thames, from the National Theatre to the London Eye to Big Ben to the Tower of London, across Tower Bridge and over the Millennium Bridge towards St.Paul’s. We spoke of everything we knew about, taking the time to explain to them (the “new tourists”) why St.Paul’s was so special and why London Bridge isn’t as cool as Tower Bridge, and to answer their questions on what is Westminster Abbey so important or what is inside the Tower of London… among many, many others. I definitely took some time to show off my knowledge of Nelson Mandela, as we made a quick stop at his statue located near Westminster Abbey. It was a night full of fun, recollection of knowledge and moments that will always be unforgettable. I’m normally pretty good with directions, but for some reason during our stay in London I have managed to disrupt that pattern in some pretty fantastic ways. My group has had to run for a good 20 minutes because of my decision to take the wrong tube line when we could have just walked to our destination in 10 minutes in the first place. I led a friend on a two-hour walk trying to find the hotel that was only two blocks away. Oopsies. But when a few friends stopped in on their way to Malaga, my sense of direction seemed to be right on. They were incredibly jet-lagged so taking any additional steps than those that were necessary was not even an option if we wanted everyone to be happy by the end of the visit. To get from the Tower of London area to St. Paul’s Cathedral isn’t necessarily that difficult, but the way my luck has been going I was nervous about how we would get from point A to point B without stopping at any tube or bus station. Thank goodness for our walking tours. Just when I was getting nervous about where we were, I looked up and saw a pirate ship on the sidewalk. Normally, such a site might throw me for a loop, but in this situation it was a sign that said ‘don’t worry, everything is working out’. Seeing Big Ben lit up at night, running across the streets, crossing the Millennium Bridge, witnessing the Tower Bridge being lifted. This was all experienced in one night when my three good friends from Dickinson had their 15 hour lay-over in London’s Heathrow Airport before going on their way to Malaga, Spain for their study abroad program. The adventure began when Anthony and myself decided to pick our friends up in the Zone Six area of London which is farther than one would expect to be from our “regular” Zone Three expeditions. It was fairly easy to get to the airport on the Picadilly line on the tube and we were pleasantly surprised to see out friends hanging out at the arrival gate. As we made our way back to the Arran Hotel we explained to them what we have seen so far of London and of course they have seen our facebook photo albums to go along with our stories. Arriving at the Hotel, Anthony, Flosha, Megan, Audrey, Rebecca and myself decided that we wanted to show Leslie, Gina and Luis the “real London” which meant a lot of walking in the few hours that they have had left to spend in England. It has been a great experience to have spent a month exploring London with my fellow Dickinson class mates, some whom I knew while attending Dickinson and some whom I got to know better by living in the Arran Hotel. However, a whole new appreciation came upon me when three of my friends, whom I have known for almost three years, were able to explore London with me. As we made our way to Embankment stop, we made sure to show them Big Ben peaking through the bridges, the Westminster Abbey, the statue of Nelson Mandela, the Tower Bridge, the Globe, London Bridge, and of course the magnificent Saint Paul’s. We ended the night by taking a ride in the legendary London double decker bus. I can just imagine how exciting it must be to be able to see another European country before heading to their destination of Spain. Their arrival to London also made me realize how easy it is to travel across Europe, and seeing London full of lights gave the city a romantic notion for me instead of the historical side that I am used to. Do beliefs make a difference in how two faiths adjust to life in the UK? Of course. Hinduism and Sikhism are incredibly different religions. One is polytheistic, the other monotheistic. One needs pages to define its practices and customs, the other a couple sentences. One supports offerings in shrines at the home, the other preaches the importance of meditation. One has a gift shop in a temple, the other a type of soup kitchen. The beliefs of Hinduism are so foreign to the English culture that it seems to attract people by its mystery. It’s something that could go either way; that is, its very noticeable differences could have inspired intense fear or interest in the English people. Based on the observations of a person who has limited knowledge on the subject, the English seem to have responded to Hinduism in the latter manner. And who wouldn’t be impressed with the absolutely gorgeous images that are associated with the religion? The figures of their gods, the hand-carved wood that adorns their walls, the bright colors of their dress- Hinduism is without a doubt a very eye-pleasing religion. Sikhism, on the other hand dresses, itself in a quite dull manner in comparison. That’s not to say that both places of worship on the outside are anything less than impressive. But the first thing that greets you at the Hindu temple is a gift shop filled with beautiful figurines that you can’t help but want to have. Conversely, the first thing you see at the Sikh temple is a small closet in which you are to place your shoes. It’s more than a little different. This discrepancy in design is more than a difference in taste. A religion that sees gods in many different forms has more to show off than a religion that recognizes only one. That’s quite understandable. What is a little less understandable is how differently the two religions were accepted into Britain. Both found a presence here in the 1950s with the Indian immigrants came over to find safety after the 1947 Partition of India. Members from both the Sikh and Hindu faiths came to England in hopes to get away from the tension and fighting that was occurring in India. This, of course, is not the sole reason for the influx of Sikhs and Hindus to England but it was definitely a major cause of it. Both the Sikhs and Hindus differ from the traditional English appearance immensely. The Sikhs wear turbans, cannot cut their hair, and tote swords. The Hindus wear bright colors and have bright red dots on their foreheads. The English wear grey and black and, while many carry knives, none too many have a sword at the hip. Though both are clearly different from the traditional British appearance, what is important to note is how the two were affected by prejudice towards that different appearance and how they remember that experience. On the BBC website, the Sikhs mention that they changed their appearance in efforts to be employed in London. The Hindus, on a website from the same news source, make no mention of racial prejudice against them whatsoever. No matter how peaceful a new group of people might be, London has never failed to have a prejudice against a group of newcomers. It’s something that would be nice to not be true but alas in my understanding it’s not. So, why this discrepancy? Both Hindus and Sikhs came from the same land around the same time for similar reasons and yet only one actually mentions the ‘dirty’ details: that there was religious turmoil that needed to be fled, and that once a safe place was found, life was less than instantly easy. I don’t really have an answer for this. I would argue that there might be certain tendencies that help point to an answer. The Hindu temple tended to be more of a bragging ground to flaunt how grand the religion was. In fact, in the museum, a sign proclaimed that there was absolutely no hypocrisy in the Hindu religion. I applaud them if that’s the case but my observations found this not to be true. Again, I have limited exposure to the religion but one that ignores the huge discrepancy in male and female rights present in the religion might be said to have some hypocrisy lurking around. The Sikh temple by comparison was what it was. It was a huge temple that also made sure to note how much it cost to build; still, it lacked a museum. In place of that and a gift shop, the Sikh gurdwara has a place to feed community members who need a meal. One recognizes the faults with the world while the other seems to cover them up with beautiful decorations. Is that what it takes to fit into British society? Maybe. But even if the Hindu section of the BBC website refuses to recognize that London may have been less than welcoming to them at times, the people who first greeted us when we came to the temple were armed guards. They were quite kind but their smiles couldn’t hide the bulletproof vests they had on. Clearly, both communities have found difficulties in coming to London. How they deal with this prejudice is quite different. Family. I’m not part of a particularly close one. This summer I was fortunate enough to stumble into Issi’s Place where I was adopted into an incredibly quirky and close-knit family of Hasidic Jews in Beechwood, Ohio. At Issi’s- a pizza parlor that keeps kosher- we got into each other’s way in the tiny kitchen, sweated through humid summer days next to the oven, stressed out over wrong orders, yelled at each other for taking too long to close the store, and then sat around for hours afterwards chatting the night away about Israel, Judaism, my life story, their life stories, life in general…It was truly fantastic. I’ve never before really had a home that I yearned for when traveling but the lack of Issi and my co-workers in my everyday life has definitely shown me just how difficult the feeling of homesickness can be to handle. With every kippah-wearing gentleman that passes here in England, I am reminded of the family I have back in a small pizza parlor in Ohio. Enter the happy part of this story. Yesterday, a friend and I stumbled upon a concert of Klezmer Music that was happening in a beautiful area of Regent’s Park. Upwards of a hundred Hasidic Jews were gathered around a gazebo listening and dancing together. Instantly, a sense of nostalgia that I’ve never experienced before just hit me. In a corner of a park in London, England, a community much like the one I so love in Beechwood, Ohio collected in a preciously familiar fun-loving, care-giving way. Now, the sentimental part of me can only go on so long before the liberal arts college student in me starts to analyze situations. Many of our readings on London’s history have addressed how immigrant communities are viewed in the city. A few of those readings have compared today’s “outcast” immigrant culture to yesterday’s “outcast” Jewish community. While this may not be the most politically correct of comparisons, it supports an optimism that London will accept the cultures that it seems to be ‘outcasting’ currently. If the same Jewish community that once was separated from the majority of the city can now celebrate a music form that has close ties to its culture in one of the most heavily visited parks in the city then clearly the city can accept what it once rejected so fully. Assuming this progression remains in place, today’s immigrant cultures that seem to be outcasts in London’s society would seem to have light at the end of the tunnel to look forward to. That being said, the hope is that London doesn’t actually continue on in the same vein as it has been. While we should celebrate the fact that the city can and eventually usually does recognize and attempt to better its mistakes, we should actively push for a change to take place to make sure that such segregation never happens in the first place. Yes, it’s great that the city can apologize but wouldn’t it be better if it didn’t have to apologize at all? Wouldn’t it be best if the mistake wasn’t made in the first place? By birth, I’m not a part of a Jewish community whether it be a secular or incredibly orthodox branch of the religion. This summer showed me that one does not need to be born into a family in order to be a part of it though. Like a family, a city cannot hose whom its members are. Maybe at one point in time this could have happened, ut- thankfully- we are past those days. We now live in an age in which cultures of all different roots are living in the same area. We need to do more than that though. We need to bump into each other, tell a few jokes with one another, and invite each other over for dinner. This may sound a little naïve or wishy-washy but I think the parallel is there. Issi accepted me into a community this summer that I could not have differed more from. He didn’t make me sit in a corner by myself and only speak when be spoken to. I went to the pizza parlor to do more than just work. An outsider both culturally and religiously, I was accepted despite our differences into their conversations and they into mine. London would do well to start doing the same. Easter Time at the Cathedral! Brownie Munchkins: Mother’s Day!!! Wait isn’t it April?!? One of the Cathedral’s many Education Days! The Norwich Cathedral Easter Experience, Day 2! The Norwich Cathedral Easter Experience, Day 1!